Looking for an armband that stands out over the rest?? Look no more! Our armbands, unlike all the others, take a totally different approach by giving you ultimate comfort in a lightweight fabric that will hold up to your active lifestyle. Why is it so comfy? Well....while other armbands are bulky and can have an uncomfortable fit due to fabric, plastic, or velcro. Ours are simple but effective! Made of 84% Nylon and 16% Lycra, it feels soft on your arm and has just enough stretch and compression so you can easily slide it on but be confident that it will stay in place. Small - bicep measures under 11"
Medium - bicep measures 11" to 14"
Large - bicep measures 14.5-17.5"
IT'S A [GAME CHANGER]: While other running armbands for women and men are bulky, have an uncomfortable fit due to fabric, plastic and velcro components and don't accommodate a variety of phone models... our workout sport armband takes a totally different approach by giving you ultimate comfort with our lightweight performance fabric that is velcro free and can FIT ANY SIZE PHONE with slim-line case (up to 7 in.). MULTI-FUNCTIONAL [USES]: Whether you are running, hiking, taking the dog for a walk, travelling or visiting an amusement park, you will find this armband is the perfect solution to safely store your cell phone, keys, money and/or cards. It is so light you won't even know it's there. The flexible fabric stays firmly in place so you won't have to pull, tug or readjust while maintaining your active lifestyle. WHAT OUR [CUSTOMERS ARE SAYING]: "Phone fits nice and snug and is really comfy. Great quality armband. Holds my phone and key fob. More comfortable than my plastic and velcro holder. 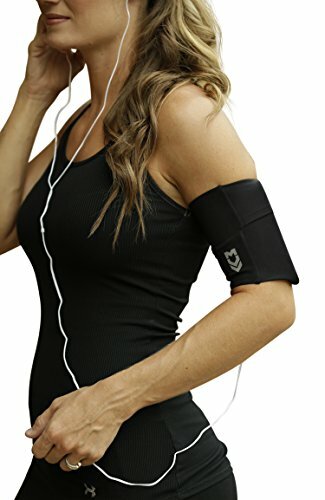 Great for hands free walking while listening to music. Hold my phone with case on it. LOVE IT! Very comfortable for running, cycling. I use a wireless headphone so this is perfect when I'm on my mountain bike or tri bike. As advertised - breathable, easy to use, stays in place during light runs or gym workouts." PROBLEM [SOLVED]: No more chaffing, no velcro, no pinched skin, no slipping, sliding or banging! You will love how easy this armband is to slip on and off; keeps you from having to carry items in your pocket; doesn't weigh you down; and keeps your hands free of clutter. Additionally, your visibility will be enhanced at night or in low light with our MÜV logo! FIND YOUR [FIT]: To find your perfect fit, please measure your bicep and choose accordingly: SMALL: <11", MEDIUM: 11"-14", LARGE: 14.5"-17.5". We recommend if you are close/in between sizes to choose smaller size for a tighter and firmer fit. If you have any questions about this product by MUV365, contact us by completing and submitting the form below. If you are looking for a specif part number, please include it with your message.